The radio frequency power amplifier (RF-PA) within a digital wireless transmitter is a critical component regarding both the energy consumption and the signal quality. Especially due to today's broadband multicarrier modulation methods that generate signals with high peak-to-average power ratio, it is very hard to construct RF-PAs that achieve good energy efficiency and fulfill the strict linearity requirements imposed by the standard. Because of this, the digital predistortion (DPD) of RF-PAs has become a key technique for implementing energy efficient, high data rate wireless transmitters. This thesis investigates theoretical foundations and practical methods for the behavioral modeling and DPD of RF-PAs. 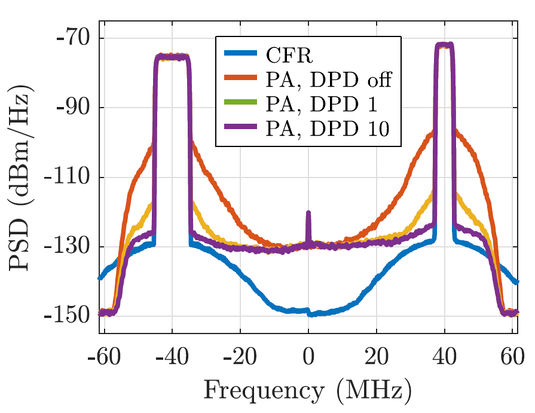 The main contributions are a semi-physical model of the joint linearity-efficiency characteristics of RF-PAs, a detailed analysis of polynomial baseband models of RF-PAs focusing on the often neglected even-order terms in baseband, and a collection of practical methods for the dual-band DPD of RF-PAs. The trade-off between the linearity and efficiency of RF-PAs is investigated based on the semi-physical RF-PA model. For this purpose, linearity and efficiency quantification methods are introduced and applied to the model. Furthermore, an overview on highly efficient RF-PA operation modes and efficiency enhancement methods is given. A central result regarding polynomial baseband models is the first formal justification of even-order terms in baseband. This is achieved by deriving explicit passband-baseband pairs for the quasi-memoryless polynomial and the Volterra series, which show that even-order terms in baseband correspond to modified basis functionals in passband. Another central result of the presented analysis of polynomial baseband models is the formulation and proof of the phase homogeneity requirement, which represents a necessary symmetry of all complex baseband models of time-invariant passband systems. The practical methods for the dual-band DPD of RF-PAs include a method for dual-band crest factor reduction by clipping and error-filtering, a dual-band DPD model based on a vector-switched generalized memory polynomial, and a dual-band DPD training algorithm based on the indirect and direct learning architectures. These methods were implemented in MATLAB and validated at the 2017 DPD competition at the IEEE International Microwave Symposium, reaching the first place within the competition. The slides of the PhD defense can be found here.